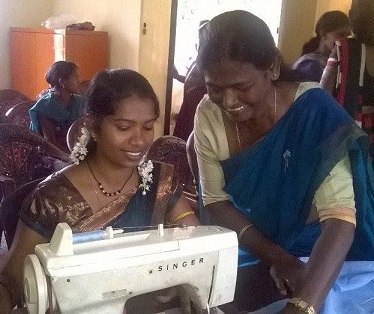 The Pupuressa Sewing Project started in August 2015 with partner organisation the Women’s Development Centre (WDC). This project builds upon the successes of the Kandy Communities project which addressed challenges on primary healthcare, education and alcoholism on the Pupuressa Levollon Tea Estate. The Pupuressa Sewing Project is located on Pupuressa Levollon Tea Estate which has a population of around 1100, and is majority Tamil speaking. Access to sanitation is poor with only one toilet for every two line rooms (houses). The majority of people on the estate are tea-pluckers and labourers at the tea factory. Options for employment beyond this are limited in the area and due to poor education and infrastructure it is difficult for people living on the estate to find job opportunities outside of the plantation. This impacts school attendance; most children drop out of school from a young age. The aim of this project is increase the capability of women on the estate to earn money via an alternative means to daily wage labour. The project will offer sewing lessons and equipment to these women. They will be taught how to sew clothes and sanitary napkins. The women will also be given the opportunity to create self-help finance groups and be offered training on group savings and credit management as well entrepreneurship skills. Furthermore, women will be able to regularly sell their produce (sanitary napkins) back to our partner organisation, WDC, creating a sustainable source of income for them. The project has been rolled out to 20 trainee women in the local Community Hall over a six month period. The project ended in February 2016. For more information please see the project proposal. For the sustainability report, please click here.